A drug that prevents the devastating damage caused by a heart attack could be on the horizon, according to new research. 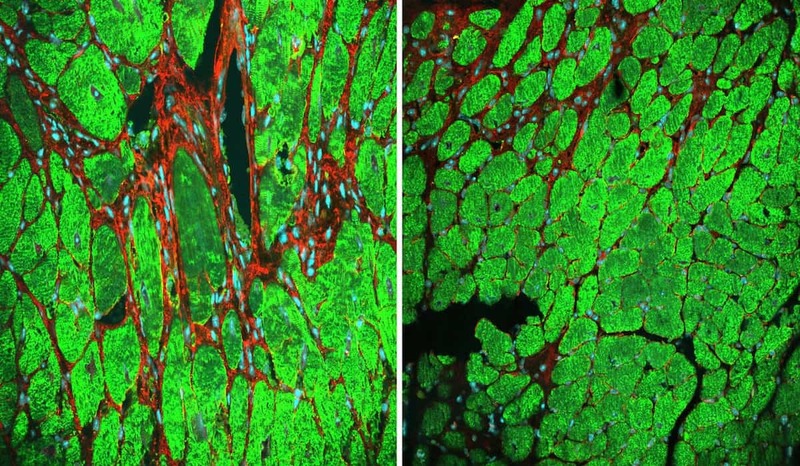 Scientists restored the organ’s function in mice by targeting a specific set of proteins – and are hopeful the same method may work in humans. The breakthrough offers hope to the 270,000 Britons who suffer a heart attack each year, often leaving them with heart failure and shortness of breath. It could also lead to new treatments for people born with inherited heart defects, called congenital cardiomyopathies. When a heart attack occurs, the muscle replaces the dead tissue with scars made of cells called fibroblasts. These do not help the heart pump and can cause the heart to weaken, a condition known as cardiac fibrosis. During a heart attack, blood stops flowing in to the heart meaning oxygen does not get in to the organ, leading to the death of heart tissue, and cardiac fibrosis. But after simulating a heart attack in the laboratory mice, Prof Yutzey’s team stopped or prevented cardiac fibrosis simply by blocking a well known molecular pathway. It also defended against the organ becoming enlarged due to the muscle being overworked, and preserved the function of the heart. The revolutionary technique involved targeting a group of proteins that pass information into cells, known as the Wnt/β-catenin signalling pathway. It is involved in several of the body’s fundamental biological processes, said the researchers. But it is ramped up in cardiac fibroblast cells after a heart attack to cause fibrosis, scarring and harmful enlargement of the heart muscle. Prof Yutzey said: “Wnt/β-catenin signalling is involved in many normal and disease processes and it’s tough to target therapeutically. The microscopic image on left shows a control mouse heart cross section after simulated cardiac injury with significant fibrosis. The image the right shows the “experimental model” in which Wnt/b-catenin was inhibited in the hearts of mice, resulting in reduced fibrosis. Scientists report early research results in Nature Communications that suggest scientists might be onto a way to preserve cardiac function after heart attacks or for people with certain inherited heart. It opens the door to preserving heart function for heart attack victims or for those born with congenital heart disease, said the researchers. Heart disease is Britain’s number one killer, causing almost 160,000 deaths a year. It is also one of the most fatal illnesses in the United States, according to the US Centres for Disease Control. And a growing number of adults who were treated for congenital heart malformations as children – many who essentially had their hearts reconstructed – face lifelong potential health complications as a result. Adult congenital heart disease is a growing priority and area of scientific inquiry at Cincinnati Children’s Hospital. Clinicians and researchers at Prof Yutzey’s medical centre are developing new strategies for adults who were paediatric heart patients. This includes looking for what so far are elusive treatments to repair scarred and poorly functioning heart tissues after heart attack or disease. The study published in Nature Communications used a newly developed line of genetically bred laboratory mice that demonstrated just how important Wnt/β-catenin signalling is in cardiac fibroblast cells. Fibroblasts are important to building the connective tissues and structural framework cells that help hold the body together. But in the context of heart disease, researchers are learning resident cardiac fibroblast cells cause a deadly mix of tissue fibrosis, scarring and diminished function. To mimic a heart attack in the mice, blood flow through the heart was restricted by a procedure called trans-aortic constriction. Some were bred so following cardiac injury they did not express Wnt/β-catenin in heart fibroblasts. The control mice that did produce it exhibited extensive fibrosis, scarring and reduced heart function. Mice not expressing Wnt/β-catenin had less fibrosis and scarring – and the animals’ heart function was preserved. Damaged by the lack of oxygen, heart muscle can undergo adverse remodelling – it changes shape. It can quickly become thin, reducing the heart’s ability to contract. This can lead to heart failure. Drugs such as beta blockers and ACE inhibitors can preserve heart function, but around 40 per cent of those with heart failure still die within a year of their first hospital admission. Prof Yutzey and colleagues aim to halt damage before heart failure occurs. Heart attacks are commonly caused by high blood pressure and high cholesterol. The researchers stressed the laboratory work is still at an early stage. It is too early to know to what extent it might apply to actual clinical treatment. But the findings, and other studies involving different molecular pathways, have intensified interest in understanding how inhibiting cardiac fibrosis improves muscle cell function and pathology. It will be a central question in future research heart fibrosis studies by Prof Yutzey and her colleagues, along with looking for possible ways to target the Wnt/β-catenin signalling pathway for potential therapeutic benefit.